Downtown Stockton has welcomed a new business. Located at 331 E. Weber Avenue, Papa Urb’s Grill officially opened its doors on Wednesday, April 8. 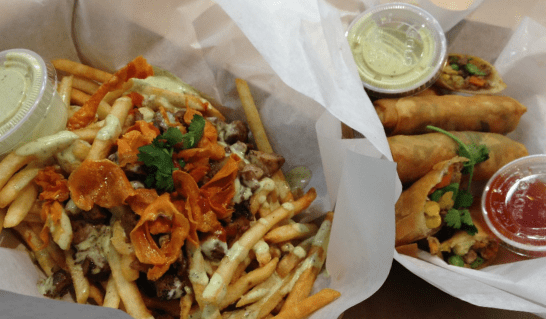 Papa Urb’s is ran by a local family with a young fresh staff serving “Filipino food with a twist,” according to their website. They are open Monday’s through Saturday’s from 10:30 a.m. to 8 p.m. and closed on Sundays. “We have a pretty good system. I don’t know of a lot of places like this. Chill, with a family operated vibe,” said Alex Urbano, a manager of Papa Urb’s. With everything under $10, the menu offers a variety of Filipino cuisines from some- thing small like an adobo quesadilla to some- thing authentic such as pancit. The most popular served dish upon the menu is “the sisig fries for sure,” according to Urbano. Papa Urb’s is a place that not only attracts to the younger crowds, but also to the older generations, especially of the Filipino culture. “It’s been fun adapting to the clientele. We get a lot of school kids after school which is the market I intended,” said Urbano. to some, there is a reason as to why the members chose the spot. “In general, downtown Stockton has a lot of history with Filipino culture. Highway 4 was built on top of Little Manila, and a lot of people lost businesses and homes. I grew up here and it has a lot of meaning to me,” stated Urbano. When asked of future plans, Urbano said they would like to expand and they have plans to keep opening restaurants. Papa Urb’s not only offered a great first time experience, but a welcoming environment with a laid back atmosphere that makes you want to visit again. “Being completely unfamiliar with Filipino food I feel that they do a great job at introducing people to their food,” as stated in a recent Yelp review. So, next time you’re in down- town Stockton, go ahead and give Papa Urb’s a try.